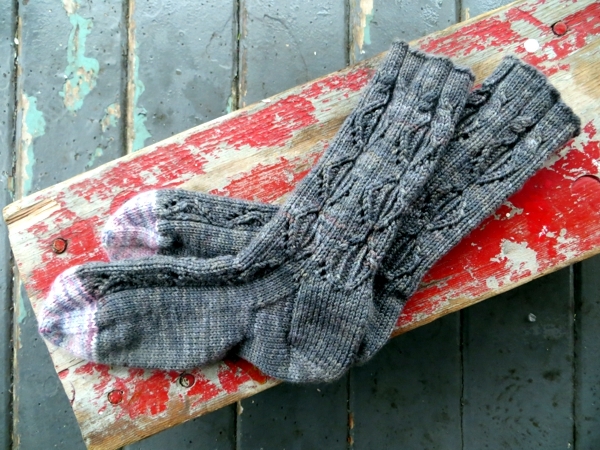 These socks have had quite a journey. 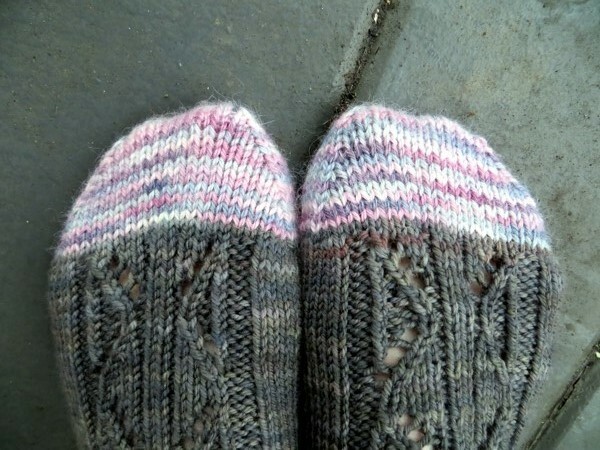 But before I go into all that, I just have to put it out there that they are the most impractical socks I've knit. 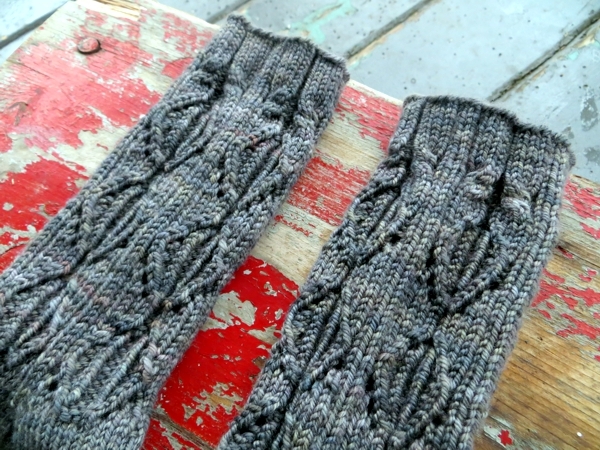 They are worsted weight, with lace. They are too short in the leg to be warm when it's cold enough to want them, and they are too thick for most of my shoes, especially the Mary Janes they'd look best with. Inside my ankle boots, all the work is invisible. But oh, are they comfortable! The yarn is Twisted Fiber Art Yummy, a cashmere blend that really is heaven to wear. This is a semisolid coordinate for one of the self-striping yarns (Slate, which goes with Bookworm, which is not being dyed at the moment unfortunately.) 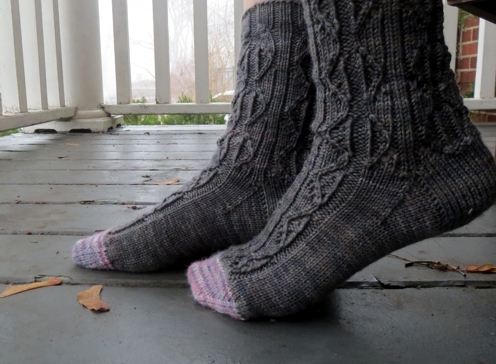 Naturally there wasn't enough in the skein for me to do all that twisty lace and have a toe as well, so I dipped into the remains of some heavy alpaca sock yarn to finish them off. I can highly recommend this course of action. Alpaca is really, really nice to toes. 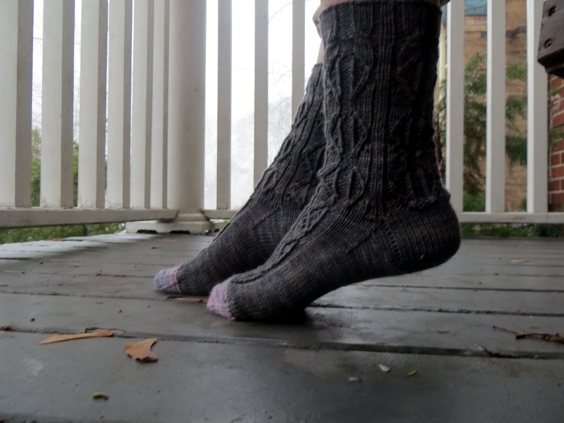 The thing about these socks is that I was really excited about them when I cast them on. 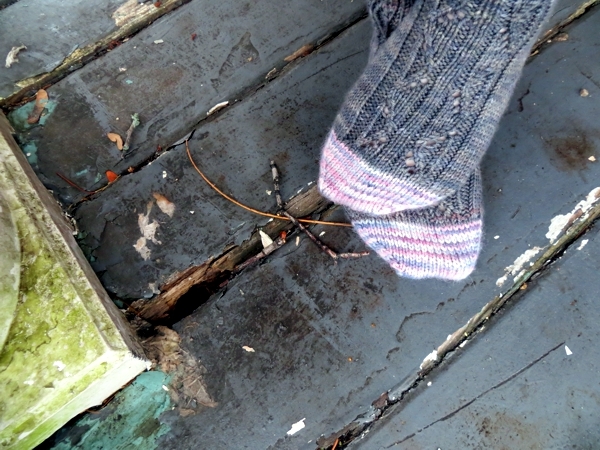 I'd seen a stitch I loved in a Japanese stitch book, and I plugged it into my preferred personal sock design and just got going. They were, hands down, the funnest project. 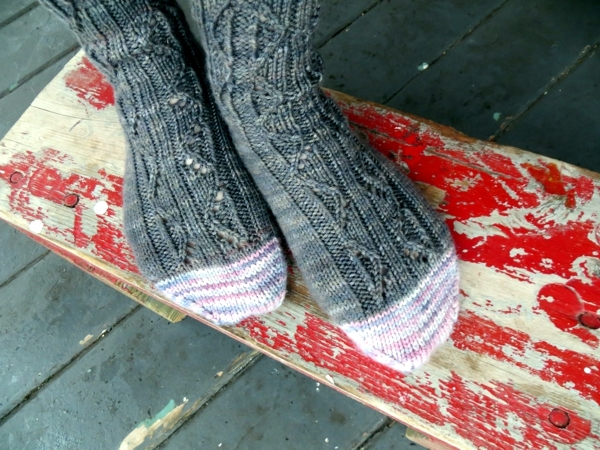 I knit them to and from the cottage over a lot of weekends and was nearly done when I stopped working on them for some reason I couldn't recall. I just kept tripping over the bag of unfinished Them at my desk every so often, and I'd think Yeah, must finish those some time. Later I came across the instructions I'd written up when I designed them, stuffed into a tote bag I use for the car on those long trips, and thought that was why they got shelved: I'd mislaid the chart and, naturally, didn't want to risk going on or making mistakes. Then I updated their status in Ravelry and when I saw the start date I'd assigned way back when, I knew the real reason. These were works-in-progress in the summer of 2012, and if you've been reading Hugs long enough you will totally get why they fell off my radar. but finally being able to wear this particular pair of socks makes me feel I'm at least on the road to it. So far, I've been finding this year to be very receptive to finishing old projects - hope it's great for your crafty ambitions too! They are beautiful, and I'm so glad you were able to finish them too! Oh Gresha - keeping busy is good when you're trying to focus on Something Else! I hope your fight is not a hard or painful one. 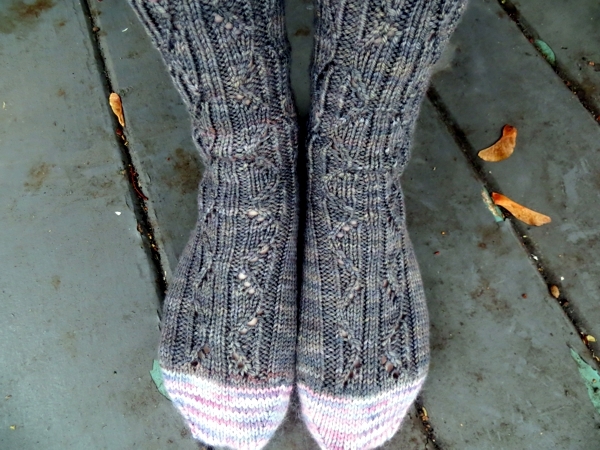 I hate to tell you this but - there is no pattern, I totally improvised these socks. The stitch is from a stitch encyclopaedia but I adapted it a bit, too. Very pretty! 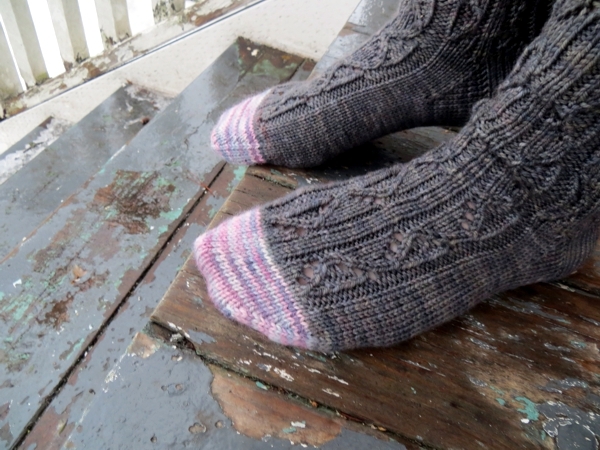 Reading your blog and seeing your socks gives me inspiration to knit a pair. I haven't done so since I took up knitting again after a looong hiatus.